Before she attended the SAG awards, Tracee Ellis Ross posed on the red carpet at the 2018 Producers Guild Awards on Saturday(January 20th) at the Beverly Hilton Hotel in Beverly Hills, CA. 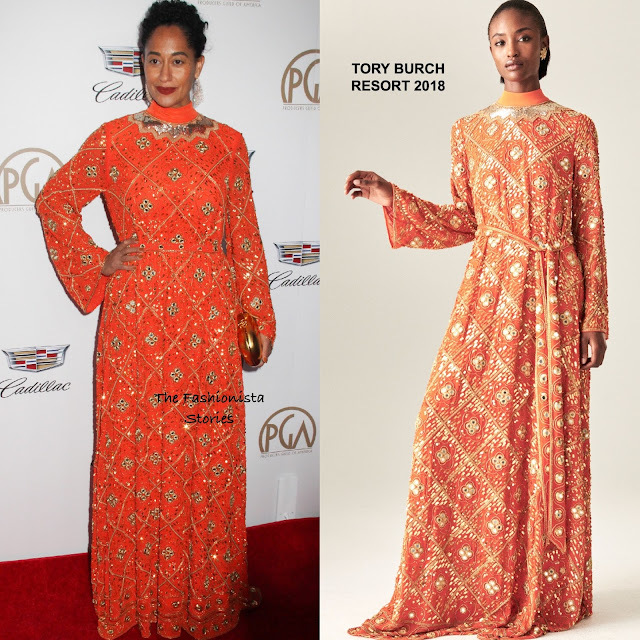 She wore the spicy orange TORY BURCH RESORT 2018 'Naomi' beaded gown with a turtleneck neckline, long bell sleeves and a removable, self tie waist. Love the color but this dress is not the most flattering on Tracee. Also the sleeves are a tad too long. She finished up with FERNANDO JORGE jewelry, a JEFFREY LEVINSON gold clutch, LOUBOUTIN heels, a red lip and a complimentary up-do finished up her look. Are you feeling Tracee's look?